The BRG is still a busy spot as the gardens are getting set for winter. This week, just in time for Halloween, a large-ish spider, a tiny toad (and lady bugs!) 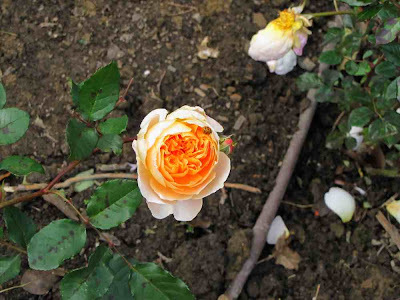 joined the volunteers and staff working in the rose and peony beds. 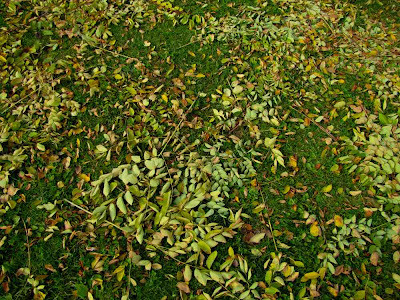 The Kentucky Coffee tree dropped its leaves and seed pods in very short order, and the hostas are going out in a blaze of color! 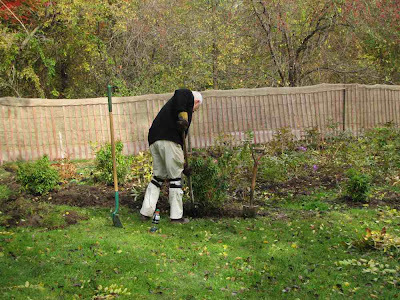 Volunteer Dave hard at work edging the peony bed already dressed with its snow fence and burlap to protect it from winter maintenance on the Waterfront Trail. 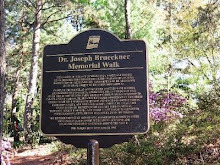 Click on image to enlarge, then click Back button to return to this page. This fat brown spider dropped in from the apple tree near the Gardens office, and stayed still long enough to have its picture taken. This little toad was the smallest of about 4 spotted by volunteers when they were weeding the rose bed. 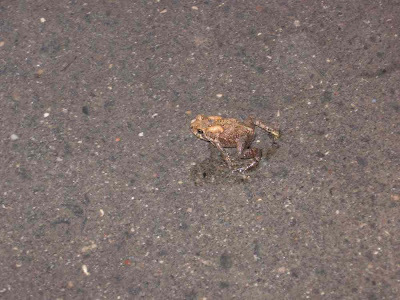 This tiny toad was hopping along the Waterfront Trail. These toads are so well camouflaged, they are usually only noticeable when they hop. 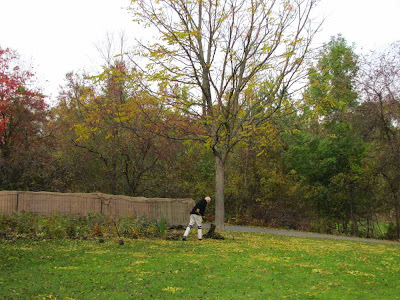 This Kentucky Coffee tree at the south end of the Peony bed lost all its fall colored leaves in just a few days. See how it looked before it dropped its foliage. 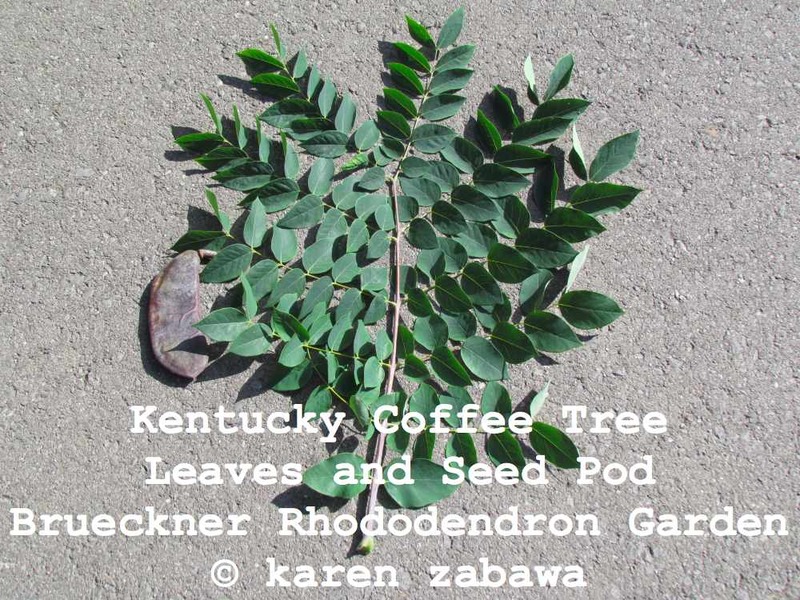 The Kentucky Coffee tree drops small branches along with its leaves, scattering them all over the peonies. Under the Kentucky Coffee tree, amidst the fallen leaves and branches, I found several pods in varying states of dryness. 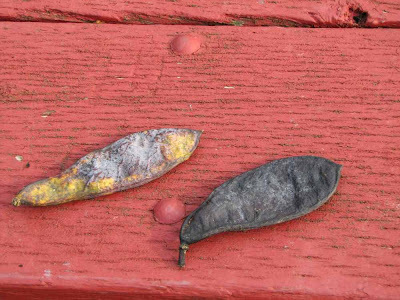 Within a day or so, both of these pods in the photo were dark black. The seeds inside the pods are very small -- about the size of a raspberry seed. 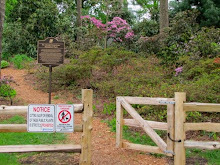 For a few days, we volunteers contemplated planting these seeds and growing a few new Kentucky Coffee trees of our own, but Voice-of-Reason (head gardener Para) made us rethink. But luckily, we didn't have to, since this tree seeded itself. 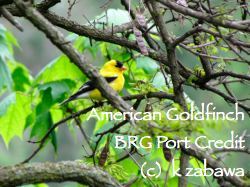 See the Kentucky coffeetree saplings here. Here is a close up picture of the leaves and seed pod of the Kentucky Coffee Tree. A lower branch needed to be removed so I took the opportunity to take a closer look of the leaves on a branch lying on the pavement. It's hard to show leave structure, shape etc. when you are looking up from below. 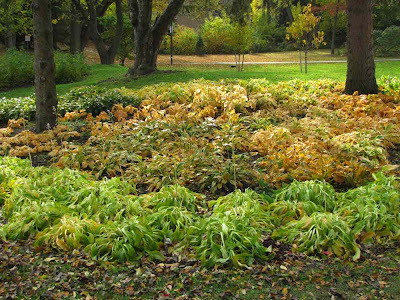 This large bed of hostas near the gardens office is dying off gracefully and colorfully, with the different varieties of hostas showing their unique shade of green and or gold. 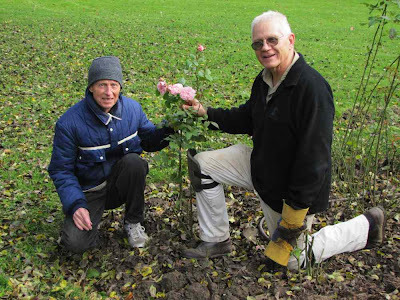 Though just a few days before Halloween, several varieties of roses are still blooming in the Gardens, like this Brother Cadfael rose with volunteers David and Don. As David remarked, "It's a rose between two thorns." Evelyn, too, is still blooming this week in the Gardens. Lady Bugs like the one shown here on Evelyn were flying about on these warmer than usual late fall days. 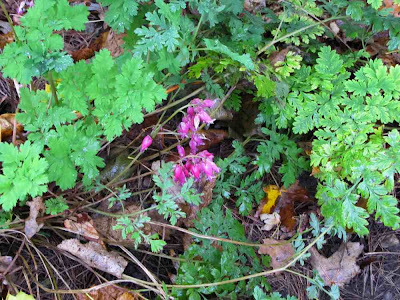 Both this nictotiana and fern leaf bleeding heart were blooming valiantly in the memorial rhododedron bed on the west side of the Gardens. These bleeding hearts are also a good companion plant for rhodos and azaleas, but are often overlooked when their showier friends are in bloom. 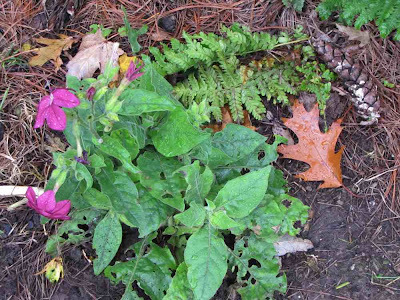 Late Fall, the gardens is still a lively spot, as the spider and tiny toad attest. The Kentucky Coffee tree, though, is done for this year, and the hostas will likely join it any day now. 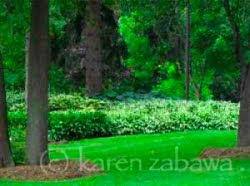 But I for one am optimistic that late fall will be kind to the rose garden and the hydrangeas!